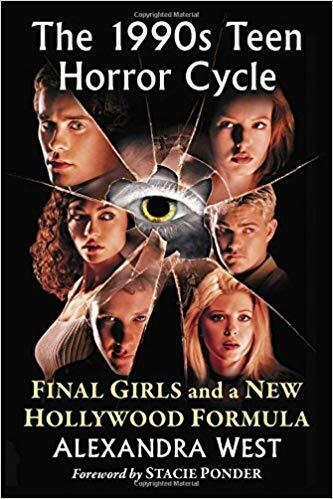 To tackle the '90s Teen Horror Cycle, West uses a similar structure from her last book by spending the first few chapters providing historical context before digging in to the movies themselves. In this case, West explores U.S. history leading up to the '90s, including discussions about the impacts of increased prosperity (for some) and the rise of third wave feminism that sprang from the Riot grrrl punk scene of the early '90 and the focus on sexual harassment raised by Anita Hill's testimony about then Supreme Court-nominee Clarence Thomas. It's through this lens that West explores films of the Teen Horror Cycle, which she asserts drastically changed the slasher formula from focusing on the villain, as they did in the '80s with icons like Michael Myers, Jason Voorhees, and Freddy Krueger, to giving more attention and substance to Final Girls. No longer were these characters walking caricatures of wholesomeness and virginity, but instead given layers of complexity and flaws often neglected by slashers of the past. West makes investigates this new-found complexity through a wide range of films from the era, including heavy hitters like Scream, I Know What You Did Last Summer, and Halloween: H20. But she also includes lesser known films or ones that people don't normally associate with this cycle such as The Crush, Teaching Mrs. Tingle, and Cherry Falls. What I enjoy most about West's style is that she reminds me of my favorite teachers who trusted their content and expertise enough not to try and be gimmicky in their approach. She doesn't bombard the reader with forced jokes or Hot Takes (TM), but she also doesn't pretend to be unbiased about the films, either. She'll discuss a film like Fear, for example, and talk at length about the themes of toxic masculinity while also acknowledging the movie's problematic "father knows best" conclusion. She won't necessarily tell the reader what to think, but she will lay everything out in detail and let reality speak for itself. Usually, I'll recommend a book because I know someone is already interested in the topic. With The 1990s Teen Horror Cycle, however, I would recommend it specifically for people who wouldn't normally be interested in horror films of the mid-late '90s. Fans should certainly read it as well, but as someone who had previously viewed the '90s as a drought for the horror genre, West's analysis provided me with new perspective that has revitalized my interest not just to watch movies I'd previously ignored, but to also revisit movies I'd already seen to view them through a different angle. And to me, horror is about nothing if not challenging our perspective. The 1990s Teen Horror Cycle is published by McFarland Press. Copies can be purchased through their website or at Amazon. So glad to hear you enjoyed this! I've been looking forward to it for slightly different reasons--mostly because I grew up with these movies and these were probably the types that allowed me to enjoy horror as a kid. To this day, I have a soft spot and a lot of nostalgia for 90s horror, especially of the slasher variety. Also, I think you will love CHERRY FALLS. I won't mention another movie it reminds me of (though West may have mentioned it in her book), but it's bonkers.